Dramatic World War II action aboard a U.S. submarine is the setting for the only film in which Ronald Reagan and Nancy Davis star together. Based on a true incident, submarine Commander Casey Abbott (Reagan) leads a daring mission to enter the heavily mined Tsushima Straits to sever a vital link between the Asiatic mainland and the Japanese home islands. Abbott charts the dangerous waters, destroys an enemy island installation and sinks thousands of tons of enemy shipping. In the course of the operation, Abbott teaches his second in command, Lt. Commander Landon (Arthur Franz), the important difference between command decision and emotional reaction. Landon is put to the test when he must order a crash dive which leaves Abbot swimming alone in the trackless sea. When rescued, Abbott is cared for by nurse Blair (Davis), and now he, too, must test his own emotions. 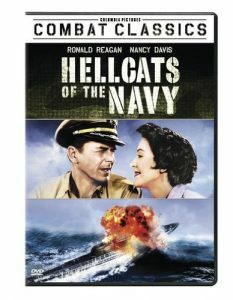 As the sole movie co-starring Hollywood’s only First Couple, Ronald Reagan and Nancy Davis, Hellcats of the Navy is either a privileged artifact or a hootworthy campfest, depending on your politics. Reagan plays a submarine (“hellcat”) commander in the Pacific during World War II; Davis is the game little nurse back on shore who’s decided he’s (this is a quote) “Mr. Right.” They share maybe eight minutes among the film’s 82. Reagan’s commander is a pretty glum guy, making unpopular life-or-death decisions into which his executive officer (Arthur Franz) reads nasty personal motives.